I started painting after I got out of the Marine Corps in 1989, doing track work in the Palos Verdes area. I spent six months or so just learning how to do prep work before I was able to pick up a brush. For the next 2 years I spent most of the time doing track work as an enamel guy. I then decided to jump to the residential field of painting by working for Student Painters out of the Fullerton area. Not too long after that, I really started to enjoy painting. I soon became the lead man and was running my own jobs. Three years later, I decided to go on my own. In 1995 I took the State test and received my California Contractors License and started Patrick Miller Painting. Patrick Miller Painting is an owner operator type of business, which means I, Patrick Miller "the owner" will come out to your house, talk with you to find out your concerns and answer any questions you might have about the project you are interested in. I feel it is extremely important to understand what you are looking for and that we are on the same page together. I will then write up the estimate. When the job starts, I will be on site performing the work "as the operator" along with some qualified helpers who have been with me for many years. I take great pride in the fact that I’m about as honest as they come. I will never promise something that I cannot deliver. On every job I will try to exceed your expectations! My number one goal on every job is to make sure you are happy and you will refer us to your friends. This business has been built on referrals, and references are available upon request. 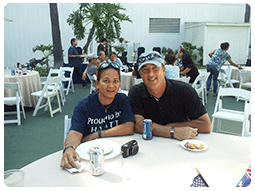 Photo of my wife and I at the Hyatt company picnic.